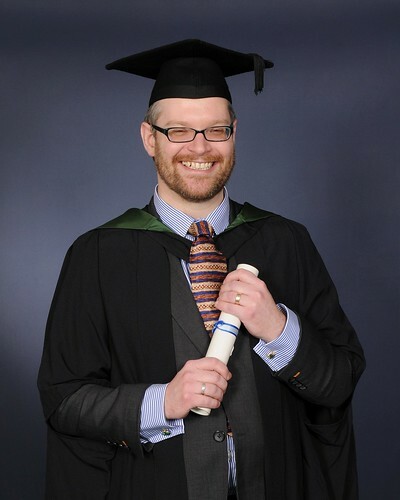 My graduation pictures from picking up my postgraduate diploma in December have arrived, which lets me write a fun comparison post. It’s not nearly so dramatic a change as the ten years from 1995 to 2005 which were captured in my passport photos. Oh, and finally, I paid to have a couple of prints of my photo and a CD, and I was really quite impressed with the copyright notice that came with it: You are granted a free licence for unlimited personal printing of this image at home or on the high street. However Tempest Photography retain the copyright of the image for the ability to make copies for reorders or schools records. 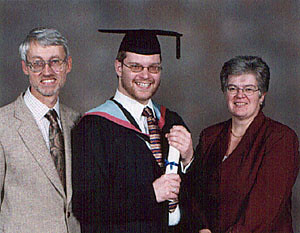 Hopefully that’s enough to allow me to post the 11MB JPG on t’internet. 2,000 steps is about a 20 minute walk, so that’s fairly achievable, and that phone ping is usually all the motivation I need to go for a quick walk to get me over the magic number as recommended by the NHS. On Friday I got the ping quite late at night, after a slightly hairy drive home from ringing, and I was really reluctant about whether going out was a good idea. 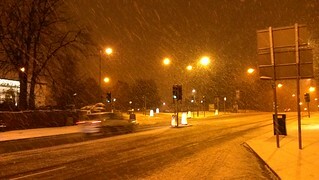 Firstly I was out in the heaviest snow I have ever seen. Big, fat, Christmas card snowflakes falling at a million a minute. 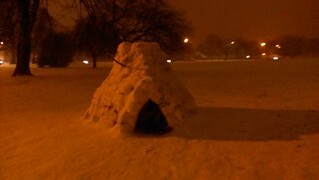 Secondly it gave me the chance to walk by Woodthorpe Park and take photos of an igloo I’d seen right by the railings on the Mansfield Road. My route then took me up Woodthorpe Drive, which is pretty steep and would tick off some more boxes on Fitbit’s “how many flights of stairs have you climbed today” measure. As I was doing this, I crossed over a bridge that was for a railway line that closed in the 1960s. In the park below, poking out of the bricked up tunnel, is a model train, along with a board recounting the railway history of the park. And third fun thing – for some reason known only to them, there was a group of lads, late teens, early twenties, gathered around the train smoking and drinking out of insulated travel mugs. What they were doing, only they know. They didn’t really seem dressed for the weather! They seemed to be having a good time, so I waved, and they waved back. Then… I made a theatrical show of making a snow ball out of snow gathered on the brick bridge and taking aim at one of them to squeals of No, mate, no, before deciding not to throw it, waving again, and continuing up the hill. The weather was still coming in thick and fast, the pavements were now under 3″ of snow and even with my Yaktrax strapped to my feet, the snow was sticky and very hard to walk in. Cars were getting into trouble making it up the hill, snow was getting in my eyes and I was sorely tempted to stop off at the Bread and Bitter at the top of the hill. Having a pint halfway round your walk for health seems a little perverse, so I persevered on round the corner into the downhill stretch. When I got to Winchester Street, the fourth fun thing happened: one of the few cars to make it all the way up the hill was a 4×4 going at quite some speed – enough to make me look up from my feet to watch it go, only to see that running at full pelt behind it was an athletically built guy in marathon gear – trainers, shorts and t-shirt! (At this point I was in vest, shirt, hoodie, coat, thermal socks, and murderer gloves) What a strange time to go for a run. I had a jolly leisure walk in the snow that all ended well. But it continued to chuck it down, and there were consequences. 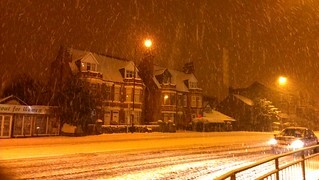 The night buses were all cancelled, and not long after, taxis were unable to get up the hillier parts of Nottingham. A friend who arrived home from London on the 2am train had to walk back to Sherwood and recounts the Mansfield Road as full of abandoned cars and buses in the wrong position on the road. Anyway, must dash. It’s raining tonight rather than snowing, but my step count stands at 9,481 and we can easily fix this. If I’d gotten around to doing Christmas cards last year, my newsletter would have had an acerbic comment about 2012 being the year in which I lost 10kg twice, this being sadly different from losing 20kg. It’s amazing how fast you can eat 10 kg back on – just over three months last summer for me. In addition to keeping tabs on my weight I am tracking some vital statistics with an old fashioned tape measure. And despite a fairly significant drop, the measurements I have taken (chest, waist and neck) have not gone down at all. And yet people have started making a point of telling me I look as if I am losing weight. Maybe it’s just because I’m wearing the bad suit I bought in a hurry that never really fit even in the dark days when I was over 100kg. I’m losing weight because I take a very sensible, fruit and sandwich based packed lunch to school. I don’t tend to eat breakfast because I just don’t feel hungry at 6am, so my daily sandwich, apple, banana and graze box tend to get me to about 600 calories by 6pm, which leaves me loads in which to eat a sensible evening meal. Although there is a cake-selling canteen at work, it is easily avoided, so basically all I can eat is whatever I take with me. So long as I avoid pitstops on the journey home, which I do most days, we ought to be at target weight before the end of the school year. I’ve also invested a little in gadgets and am currently wearing a Fitbit Ultra tracker (no longer on sale) which is helping me count steps every day, turning that into km walked, and also, thanks to a tiny onboard altimeter, it estimates how many equivalent flights of stairs I have climbed. I can also wear it at night on a wrist or ankle cuff and it tells me how well I slept and for how long. During flu days I have been sleeping for 18 hours plus. And newsflash – when I’m at school I am spark out within minutes of head hitting pillow and I stay fast asleep almost all night! The magic scales have once – ONCE – recorded a weight below 90kg in the last few days, but apart from that they have been, ahem, faulty. I have also taken to calorie counting using MyFitnessPal, which is pretty awesome. A) it links seamlessly to fitbit’s data tracking. Standing on the wifi scales automatically sends my weight to MyFitnessPal too. B) it has the most complete food database I have encountered during quite a lot of experimentation. And it’s actually UK food! also C) the mobile phone app has a barcode reader that is also helpful! Here is a short list of six types of teaching activities that I tried for the first time last term that I think worked for me and my classes and that I will definitely be doing again. I found out about this from this blogpost by MonsieurM and immediately thought it was an ace idea and put it into some of my lessons. I’ve used it in observed lessons and those who saw it liked it to, and awesomely I’ve started to hear about it being used in other MFL teachers’ lessons at school now too. If anything I might have used it a bit too much last term, and I have to rein it in a bit. The idea is simple. You make a set of cards. Each student has their own card with a French phrase and the English translation. Students need to be familiar with the vocab before starting. Students stand up and find a partner. A reads the French phrase, B has to respond with what that means in English. A uses the English on her card to verify and to nudge B in the right direction. Once guessed, B reads her French phrase and A responds with English. Once both have done this, they swap their cards and go off and find another partner to begin again. The activity lasts 8-10 minutes and you can then ease them into writing sentences of their own, starting with the last card they had, and then putting the vocab together themselves. An example set of cards is here on the TES for teaching “In my bedroom” in French. It’s easy to make up the phrases you need – if you have 10 items of vocab in a lesson, plus 3 sentence stems such as “In my room I have”, “In my room I don’t have”, “In my room I would like” you can easily get to 30 unique cards. There’s something about giving dice to students that makes them suddenly more interested. If you gave them a vocab sheet and said, “randomly pick a sentence from each category and write it in your book,” sure, some would do it, and most would not settle to it. But if you give them a vocab sheet where the items are numbered and let the dice choose how to put the paragraphs together, somehow they are magically sucked into the activity, calm descends, the room goes quiet, and you can walk around the class watching children who definitely do not yet know how to write in the past tense in French, magically putting down perfect paragraphs into their exercise book. Once you remove the dice and support again, no-one will ever know from looking in their books, that they didn’t come up with the paragraphs themselves! An example sheet is here on the TES – we were doing “describe a past weekend in town”. There are 1-5 items to choose from – if they threw a 6 they had a free choice of what to write. There is a tiny danger that completely random selection of sentences meant slightly nonsensical paragraphs, for example: last weekend it rained so I went to the beach and sunbathed. The kids were delighted at some of the combinations and quite aware of the nonsense. Differentiate up by giving a selection of mid-to higher level connectives and asking able students to include them in their paragraph. This idea was something I got and simplified from Vincent Everett. I can’t now find the exact resource, but he had a writing activity about a murder mystery, and who had killed whom with what was decided by dice. This came to our department from an NVQ languages training course and all of us have used it since. You take a text, and set the language teacher’s staple activity of “Find the French for…” Then you make a crossword out of the answers. The students will know they have got the answers right if the crossword works, so the activity is essentially self marking. I have uploaded one I did – again from the KS3 topic of describing a past weekend. This one, I think, was pitched wrong – this was much too difficult to use to introduce the past tense, and even my most able students struggled to complete the activity. Another example of giving them dice… There are tons and tons of snakes and ladders grids on the TES, and using them in a language context is fairly easy. Groups of four students play snakes and ladders, and the squares without either snakes or ladders have pictures which they have to turn into a TL phrase. Another idea I got from Monsieur M that I first thought would be limited to able older students, but realised could be used with younger, less experienced students too so long as the topic was strictly constrained. You have a deck of cards some of which have French phrases on them, and a few have “Trichez!” (Cheat!) on them. Students draw a card. If they have a phrase, they read it out and place the card face down on the discard pile. If they have “Trichez!” they have to make up a phrase and say it and place the card etc etc. The challenge of the game is that they have to make up the phrase and say it without the other players spotting what they are doing. I gave them plastic counters as a way of keeping score, and played this with year 7 as part of a series of lessons on telling the time. You can see how if you were doing this as part of revising ready for a speaking assessment you’d use a wide variety of different phrases from the topic. If you doing it with younger students, you just need to use only a very narrow set of phrases. Time telling was ideal. You might want to explicitly model strategies for playing with them, eg explain most people will get a trichez card at some point, so before you start playing, have a time phrase in your head and use that when the trichez card comes up. Having decided to use dice, I had been borrowing them from a colleague. I thought a needed a set for my own classroom to avoid having to borrow them too often, and bought a set on Amazon. The day they arrived, I didn’t have a lesson planned to use them, but I did have a lesson that ran short so I quickly invented a simple game. Now all I need to do is think of some strategies to make them be more careful about not throwing the dice stupidly so that they fall off the table. Oh, and they love the dice and there seems to be a tendency for them to go missing, so I have to be careful to count them out and count them in so I am not losing them. So here are some lovely activities I did last term that I enjoyed and I think my students did. They were new to me, but they might be old hat to you. Strangely there are a bunch of things I did on teaching practice last year that I assumed I would use regularly and have just fallen out of my routines. Must bring them back! Battleships is the obvious one. News reaches me via the glamorous Paris Daily Photo that the once legendary Virgin Megastore halfway up the Champs Elysées is to close. This wouldn’t normally create any waves at all for me, but when I read the news, sipping my weekend evening hot gin toddy, I had a violent flashback to my time in Paris during my year abroad in 1999. This Virgin Megastore had a café bar as part of one of its upper floors, which had an extensive cocktail menu – and the killer – a happy hour at the sort of time students about time could make use of it. We were at the British Institute in Paris, and I lived on the Av. de la Motte Picquet in a very bad room in a highly desirable part of town. We could walk to the Champs-Elysées in less than half an hour. It all seems so unlikely that I am wondering as I type this whether I am misremembering. Would we really walk that far? Could you really buy cocktails in a Virgin Megastore? Could we ever afford to drink there on a student budget? Who’s idea was it anyways? All a mystery to me. This has been going on for weeks now. The Times Educational Supplement has fantastic resources for teachers – including the best job search system out there that got me all of my interviews and my NQT post. It has loads of articles and blogs that are useful, and once you log in you can download other resources that teachers have uploaded, that can really help make your lesson planning quicker. I get sent multiple links to the TES every day – I subscribe to their 50% helpful “New Teacher” mailing list (the other half is mostly about primary and mostly not applicable). I follow TESmfl on twitter, and they tweet about the crème de la crème of MFL resources – both individual activities and wider professional development suggestions. And then I want to log in and search. Does anyone else’s scheme of work teach German prepositions in a town context? Apparently not, they’re all doing it in a bedroom context (the teddybear is ON the bed, the table is NEXT TO the door etc). But at the moment I can’t get in! It’s extremely frustrating! Neither my Mac or my PC on my desk can log in. I can use my school laptop at school to do it, but not at home. Every time I get the Chrome error “This web page has a redirect loop” and the helpful suggestion to clear my cookies for this page. I have googled until I am blue in the face, but cannot work out how to make Chrome clear the cookies for a single page. I’ve found a nice helpful setting to clear ALL the cookies, but that seems a little bit drastic. I have tried firing up Indernet Exploder to do the work I need to, but that is now completely ghastly. It takes over half an hour to load, is festooned with weird toolbars that must have come in with games, and fires up so many different error and warning messages you start to wonder if you’re really wise to continue.